The true chocophile’s trade secret. Chocolate’s equivalent of The Wine Society, and destined to play a crucial role in the democratisation of the good stuff. There aren’t many monthly deliveries that deliver so many moments of thoroughly enjoyable indulgence and impart equally enjoyable education as they do so. 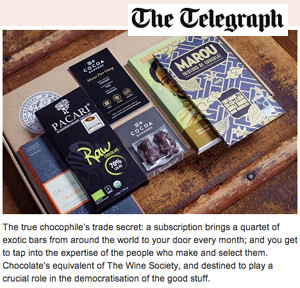 Cocoa Runners brings artisan chocolate from all over the world directly to your door – and a new series of themed monthly tasting salons promises to reveal some top-notch choc over a few glasses of wine. What could be better? Wine plus chocolate equals everything you’re not supposed to consume post-Christmas. We say, life’s too short – get yourself to The Winemakers Club in Holborn for an evening hosted by Cocoa Runners, for a few glasses of wine and to discover new producers. What’s better than chocolate? Chocolate delivered monthly to your door. Who could resist a chocolate subscription service? A taste of just one of their bars is like tasting chocolate in Technicolor. In case you haven’t heard of [Cocoa Runners], these guys scour the globe to find the best chocolate out there. So – no joke – this is not just any chocolate but the most painstakingly made artisan stuff, which contains none of the crap that most mass-produced bars do. (Thus, you can claim it is a healthy way of consuming chocolate…). And rather than being snooty about it, the idea is just to try a bit of everything and find what kind of thing you like. Awesome new service is built specifically for all you chocolate lovers who want the best bars out there, delivered straight to your home. Not only is it a great gift, it’s perfect for yourself and some wine – have your friends over and do your own monthly wine and chocolate pairings. As you come to expect from Cocoa Runners, each of these bars is noteworthy in its own right. This collection has been exceptionally cleverly-curated – without exception, I enjoyed each inclusion. A few of our favourite tweets! 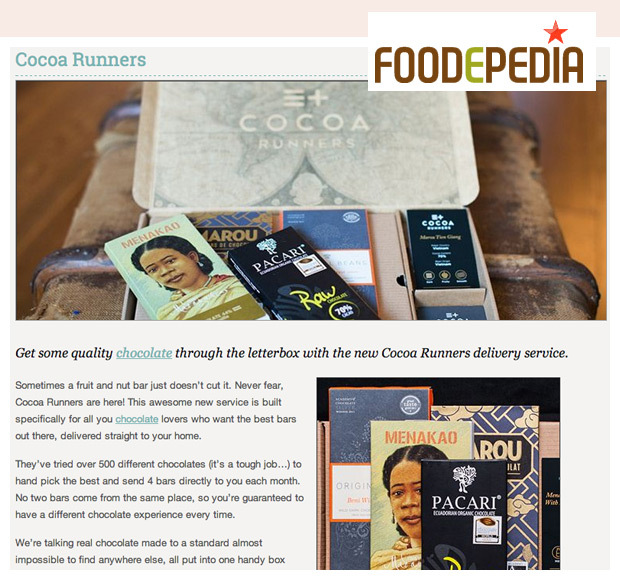 We’d love to hear your feedback on our service and the chocolate, so feel free to Tweet us @CocoaRunners at any time!